Situated in the village of El Soto with views towards the "pueblo blanco" of Vejer de la Frontera and towards the salt marshlands of Barbate. 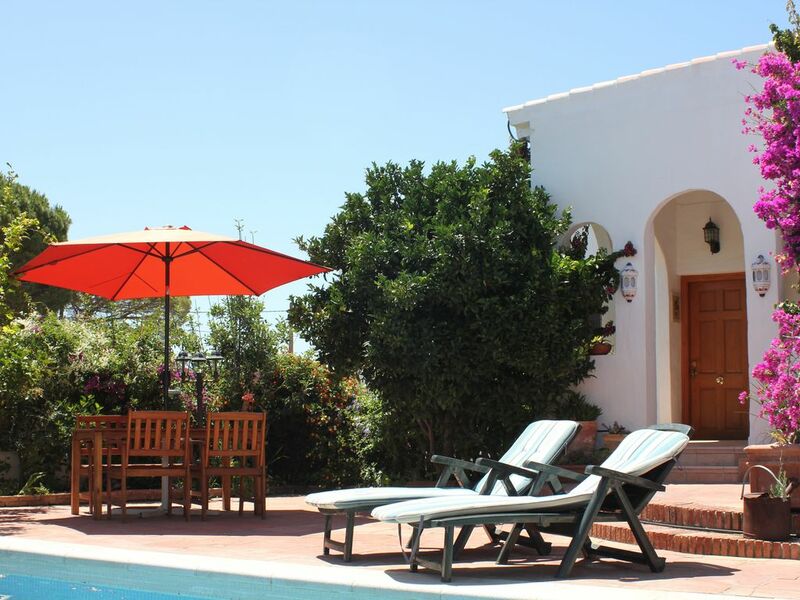 The local area is unspoilt with beautiful sandy beaches at El Palmar, Trafalgar, and Conil - all within a 20 minute drive.The casitas are set in a secluded garden with 10m x 4m solar heated swimming pool. The ideal spot for a peaceful and relaxing holiday. Everything you need for your holiday is provided. The clatter of the storks will amaze you. Helen and Gerry are on site to ensure you enjoy your holiday. We do provide a welcome pack but if you would like further shopping say from Morrisons in Gibraltar we would be happy to oblige. Montenmedio is a short walk away. San Andres, 25 mins drive. Novo Sancti Petri, 25 mins drive. Benalup, 20 mins drive. Notes on accommodation: Double beds are standard but singles can be substituted if required. Heating and fans provided. Linen and in house towels provided. Laundry facilities available. Outside: Good sized private swimming pool heated by solar panels, BBQ available, private garden not overlooked, tables, chairs, umbrellas and sunloungers. We had a very enjoyable 7 days at Helen and Gerry's property. We are a family with two small children and arrived fairly late after a longish drive from the airport. Gerry made us welcome straight away and the property was equipped with foods such as bread and milk which were very handy! The weather was a bit varied during our stay but we were always comfortable and entertained as the house was well-equipped and Helen and Gerry kindly lent us games for the rainier days. On dry days, we used the lovely (heated pool) and sat on the loungers. The village (El Soto) is fairly quiet and there aren't really any amenities but this was fine with us as we like quiet locations and had a hire car. Vejer de la Frontera is just a few minutes' drive away, as are the beaches. The house was great value for money and Helen and Gerry were very friendly and helpful hosts so wouldn't hesitate to recommend a holiday here. We had a very relaxing week at Casita Apartments. Gerry & Helen were excellent hosts and went above and beyond to help us out in any way they could - local advice, baby equipment, provisions. The apartment was clean, comfortable and well equipped - and the pool and terrace were beautiful. Our young kids loved watching the local wildlife - goats, storks, horses - and there was lots to see and do within a short drive. Vejer was spectacular and there were plenty of beaches close by. Thank you for having us and we hope to make it back one day. It is a great place to explore the beaches of Zahara and Los Caños de Meca and others. Great place to rest with your family. The swiming pool is fantastic. Helen and Gerry are very friendly. Miguel and his family were welcome guests. They are a very friendly and considerate family and we are glad everything was good for them. El Palmar, 15 minutes drive. Los Canos de Meca, 20 minutes drive. Zahara de los Atunes, 15 minutes drive. Cape Trafalgar, 20 minutes drive. Airports at Jerez approx 1 hour away. Gibraltar approx 1 hour away. Vejer de la Frontera is within 10 minutes drive. Local daily deliveries of bread. Vejer de la Frontera has all facilities including some fine restaurants. Barbate also has all facilities with good restaurants and a market. Dehesa Montenmedio, a golf and country club famed for its equestrian events and golf has good restaurants and is only a short walk away. Local activities include golf, windsurfing, kite surfing, bird watching, rambling, quad bikes, four wheel driving, equestrian activities and language courses. Booking Notes: 100 Euros to be paid on booking, balance on arrival. Discount for long term bookings. Changeover Day: Saturday is normal changeover day but other requests will be considered whenever possible to ensure you get the best possible flight prices.